Regenerative Blowers Market size was estimated over USD 750 million in 2017 and the industry will grow by a CAGR of more than 4.5% up to 2025. Upsurge in personal living standard, coupled with rapid urbanization in developing economies, has escalated the growth of industrial sector in Asia Pacific region, triggering the growth of regenerative blower market size in the forecast time spell. China is showing a strong economic growth, as its GDP grows by 11.2% and reached USD 12.86 trillion in 2017. Industrial sector of China contributes more than 35% in this GDP and the trend is expected to follow due to supportive government initiatives related to the ease of trading and upsurge in FDI inflows. This will substantially increase the product demand in the industrial sector as blowers are widely used for reduction of friction on rollers and conveyors, improvement of combustion by waste gases removal, movement of light materials through vacuum transfer, etc. Technological advancements and superior features such as less noise generation, compact design and reduced maintenance cycles will subsequently affect the growth of regenerative blower market in positive manner by 2025. Stringent environmental norms and focus on reducing water footprint by means of efficient treatment solutions and reuse of water will boost waste water treatment industry in future. Population growth in Asia Pacific region has put pressure on the limited water resources, thus encouraging wastewater treatment in the near future. This will positively influence the entire regenerative blowers market by 2025 due to its extensive usage in wastewater treatment for the aeration of sewages, rivers, ponds and tanks. In China, 400 out of 600 cities face water shortages and the Chinese government had set targets for sewage treatment of 95% in cities in year 2017. Water industry in China is anticipated to grow with around 15% CAGR in next few years due to rise in investments by government in water pollution control projects. This trend will continue and significantly contribute to the regenerative blower market growth over the forecast timespan. 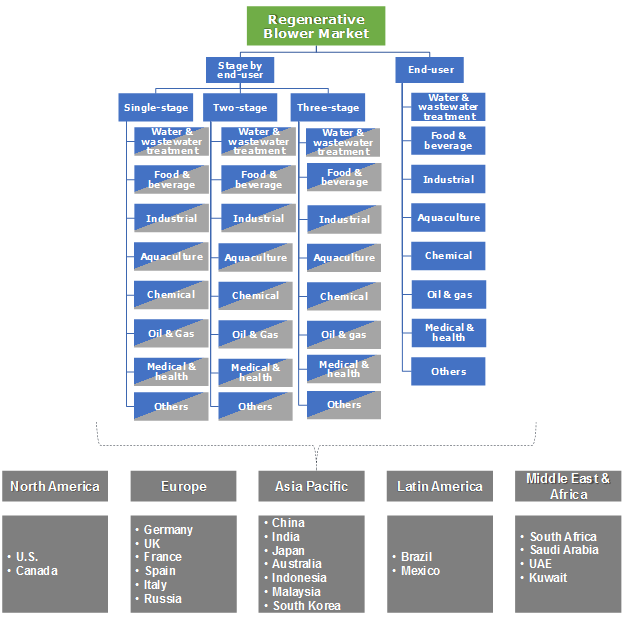 Global regenerative blower market is classified into three categories based on their stages which include single, double, and three stage regenerative blowers. Among these, single stage regenerative blowers accounted for almost 70% of global share in 2017 and this trend will likely grow in coming years. Single stage ones are used in food and beverage industry for pneumatic conveying of fragile food products to handle them gently due to their characteristics of generating greater airflows at lower pressure. In terms of revenue, two-stage regenerative blowers segment was valued over USD 150 million in 2017 and will significantly expand its market size by 2025. The product is widely used in the industrial sector due to its high pressure, low maintenance and other beneficial features. Regenerative blowers have applications in different end-user industries, of which industrial sector accounted about a quarter of the global market share in 2017. The product found its applications in separation of excessive material in cutting and stamping, pellets and granules fluidizing, printing press processes, paper trim removal, suction gripping, and various other processes of industrial sector. Industrial manufacturing sector is the second largest contributor to Europe’s GDP due to significant rise in exports, government expenditure, investments and net trades of European countries such as Germany, Austria and Netherlands. These trends are expected to follow and will drive the regenerative market share in forecast timeframe. Global regenerative blower market is led by Europe accounting for almost 30% of the global volume by 2025. Regional demand for regenerative blowers is driven by strong growth in application sectors such as chemical, industrial, medical, oil & gas, petrochemicals, fertilizers and agrochemicals, etc. Capital spending in chemical sector in Europe has increased from USD 18 billion in 2006 to USD 30 billion in 2016. This will positively influence the regenerative blowers market growth in future. Based on revenue, Asia Pacific shows the highest growth rate of over 5% from year 2018 to 2025 due to rapid growth in industrial sectors, low labor cost and recent initiatives taken by governments of India and China to setup industrial complexes. China led the region with more than 25% of the entire revenue share due to presence of various end-user industries such as chemical, oil & gas, food & beverage, etc. Hitachi Limited, Busch LLC, Gardner Denver, Elektror Airsystems, Atlnatic blowers, Gast Manufacturing, Becker Pump Corporation, The Spencer Turbine Company, Ametek Inc., KNB Corporation, Air control Industries. Dustcontrol AB, Airtech Air Systems Ltd, Rexchip Blowers, Chaun Fan Electric Co. are some of the prominent players in the regenerative blower market. Companies are adopting organic growth strategies such as diverse product range and production line expansion through product development and launch. For an instance, in February 2018 Becker Pump Corporation introduced new SV series of regenerative blowers to generate greater capacities with lower horsepower. These blowers are compact in design, due to which they are light in weight and produces less heat and noise. Regenerative blowers are used for waste water treatment processes for repeated aeration of the effluents as they are capable of delivering large volume of air at lower vacuum levels or pressure. Blowers have a wide area of application in industries such as water & waste water treatment, food & beverages, chemicals, oil & gas, medical & health, etc. Increasing oil & gas exploration activities in the U.S. due to the significant investments in the industry will spur the demand for product in coming years, as it finds extensive usage for the recovery of vapors and gas at the time of drilling in oil & gas sector. 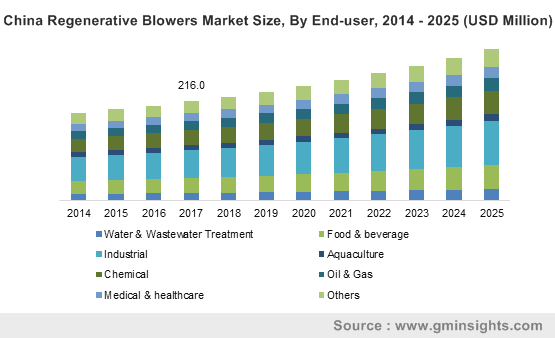 Growth in food & beverage sector, especially in Asia Pacific region, owing to population growth coupled with increase in disposable income will have a positive impact on regenerative blower market growth by 2025.